I would love to get a tattoo, but I have no idea what I want! I don’t want to get just anything if I’m going to be stuck with it for life, I want it to be something that means something to me. 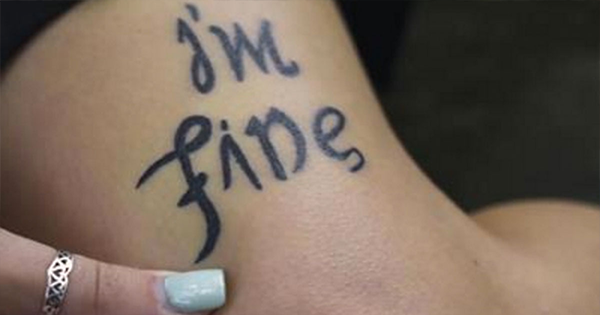 Bekah Miles is a student from Oregon and she is making waves with her clever tattoo design about depression. There was a time tattoos were stigmatized to represent the outlaws of society such as pirates, prisoners, and punks. These days they are very common. Recently tattoos have taken on a different role. They have come to signify rallying cries in the fight against the stigmas of mental illness, and we think it is amazing! Miles recognized that her own experience with depression was probably not too dissimilar from that of other people suffering from it. It is easy for the words I’m fine to roll of our mouth, even when we are far from it. Just by reaching out to someone you can make a massive difference if you think something is wrong, it is nice to know that someone cares. It’s surprising how many people go through feelings of depression, anxiety, or other mental illnesses.